The ISO 27001 Internal Auditor training in Bangalore, Karnataka focuses on providing training to selected Internal Auditors to enable them to conduct audit as per ISO 27001:2013 standard. Who must attend this Course? At the end of the ISO 27001 Internal Auditor training course, an Examination is conducted and test papers are evaluated as per the Criteria. Accordingly, certificates will be issued to Internal Auditors who pass the test as per the test criteria. Will be provided by us to all participants who attend training sessions on all the days. Experienced and qualified ISO 27001 Lead Auditor. 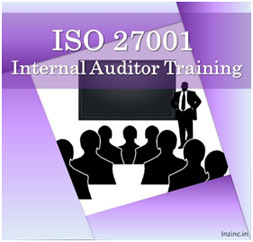 Though not mandatory, it is better that candidates go through the ISO 27001:2013 Standard before attending the course. This will help them in grasping the concepts better. We provide ISO 27001 Internal Auditor training in Bangalore (Bengaluru), Bagalkot, Belgaum (Belagavi), Bellary, Bidar, Bijapur, Chamarajanagar, Chikmagalur, Chitradurga, Coorg, Dakshina Kannada, Davanagere, Dharwad, Gadag, Gulbarga, Hassan, Haveri, Honnavar, Hospet, Hubli (Hubballi), Kolar, Koppal, Mandya, Mangalore (Mangaluru), Manipal, Mysore, Nanjangud, Raichur, Ramanagaram, Ranibennur (Ranebennuru), Shimoga (Shivamogga), Tiptur, Tumkur, Udupi, Uttara Kannada, Yadgir, and other cities in Karnataka. We also provide ISO 27001 Internal Auditors Training in Chennai, Coimbatore, Hyderabad, Amravati, Vizag, Vishakapatnam, Trivandrum (Thiruvananthapuram), Kochi, Panjim (Goa), Pune, Mumbai, Nashik, Gandhinagar, Vadodara (Baroda), Ahmedabad, Jaipur, Johpur, Chandigarh, Delhi, Kolkata, Bhopal, Baddi, Gurugram (Gurgaon), Gwalior, Noida, Indore, Haridwar, Dehradun, Jamshedpur, Durgapur, Bhubaneswar, Raipur and other cities in India.